China is now Australia’s largest trading partner. 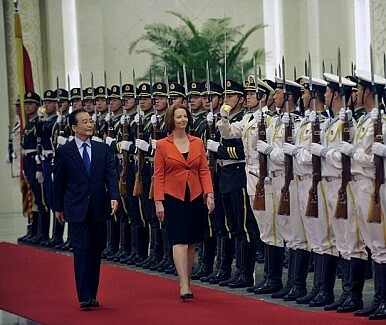 Will Canberra shun its traditional allies in favour of Beijing as a strategic partner? Australians recently remembered the September 11, 2001 attacks on New York and Washington with solemnity, respect, and reflection. Responding as they did to this day of infamy undoubtedly further strengthened and reaffirmed the US-Australia alliance. Yet this year marks not only a decade since 9/11, but also the 60th anniversary of the alliance since the ANZUS Treaty (Australia, New Zealand, and United States) was signed in 1951. Following the 9/11 services, it was announced that US President Barack Obama is scheduled to visit Australia from November 16 to 17, in part to commemorate the ANZUS milestone. Will Obama find a changed Australia? This is the ‘new view’ emerging in Australian strategic circles. China is now Australia’s largest trading partner, and in response this view argues that Australia must ‘choose’ a strategic future informed by the supposed power shift from Washington to Beijing. Yet the alliance with the United States is unlikely to fracture – even with a more influential and powerful China. Supporters of the ‘new view’ misunderstand Australian identity and engagement with the region post-1945. Since Britain forsook colonial investments (except for Hong Kong) and sought refuge in the European Economic Community in 1973, Australia has been involved in what could be called an ‘Asian Dance.’ Australia’s engagement with Asia has never been anything more than a dance with several partners, each nothing more than a fling, with loving and longing looks across the seas to Great Britain. At different times and for different reasons, Asian nations have courted Australia, but none have been able to enjoy consummation because Australia’s passion for ‘new love’ is as dry as the red desert sand of the Outback. The reality is that Australians have special affection for only three nations on earth. The first is New Zealand, a country that in the early 1890s had indicated interest in joining what became the Commonwealth of Australia. Australia’s military history is unrecognizable without the ANZAC spirit (Australia and New Zealand Army Corps) forged on the beaches of Gallipoli in Turkey in 1915. The second is the United States. This alliance is central, but must be viewed in the context of shared cultural and political values, common experiences, and commitment to democracy. The debt owed to the United States by Australia during the Pacific War will also never be forgotten. The sacrifice of many US servicemen during this conflict for the sake of freedom forged an abiding relationship between the two nations informing the creation of the alliance itself. The third country, Britain, is important because of the emotional, familial and historical ties with the motherland or land of origin. All Australians (with the exception of indigenous peoples) are immigrants. Before the Pacific War, this usually implied Britain (although since 1945, it has come to mean anywhere in the world). The new view on China fails to understand the profound impact multiculturalism has had on Australian society and identity. Contemporary Australia is by definition ethnically diverse. Filial ties extend across Asia to Europe, the Pacific Islands, New Zealand, South Africa, the Middle East, and Africa. As in the United States and New Zealand, these ethnic groups have political lobbyists, constituencies, concerns, and political influence. This multiculturalism also reaffirms and strengthens support for New Zealand and the United States. Importantly, Australia remains a constitutional monarchy, with enduring affection for the British Queen and her successors. Despite several attempts, political elites have failed to sever symbolic ties with the Crown, the most recent being in 1999.